Update (08/22/2012): I have posted a similar but simplified method for calculating the breakeven rate here. What level of inflation do market participants expect over the next 5, 10, or even 30 years? There are many methods of varying complexity that investors and policymakers use to estimate the level of expected inflation, but one relatively straightforward method is to examine the “breakeven” inflation rate which is the difference in interest rates between Treasuries and TIPS. This method has the advantage of being determined by market prices, so it reflects the views of investors who have money on the line. 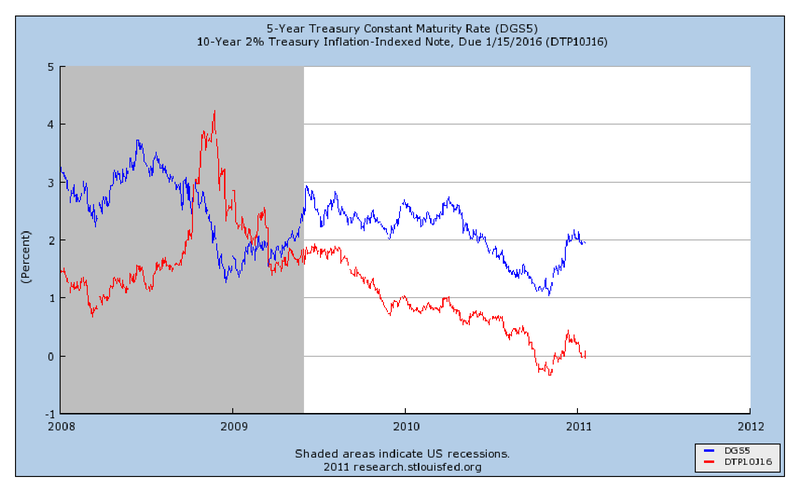 The 5-year breakeven inflation rate is the difference between the 5-Year Treasury Constant Maturity Rate (in this case the most recent rate is 1.95%) and the yield on an inflation protected security with 5-years remaining to maturity (in this case -0.04%). Therefore, the plot implies investors expect inflation of approximately 2% annually over the next 5 years. It can also be seen from the graph that the breakeven inflation rate, while not particularly high, has been rising over recent months as the gap between the two series has widened. Notice that this plot shows a 10-year off-the-run inflation indexed security with 5-years to maturity. The purpose of using the off-the-run security, rather than the a 5-year on-the-run bond, is to reduce the distortion in rates caused by the deflation protection aspect of TIPS, although that effect is less of a concern today than it was during the crisis of 2008. Why should we expect that the difference in yields is equal to the market’s expectation for inflation? If investors expected future inflation to be greater than this difference, then this would make TIPS, whose coupon and principal payments are indexed to the CPI, more attractive to investors than nominal Treasuries and the difference would increase as investors sold Treasuries (pushing down the price down and yield up) to buy TIPS (pushing the price up and yield down). If inflation expectations were lower than this difference, then Treasuries would be more attractive to investors than TIPs and the opposite effect would occur. Therefore, in equilibrium, the difference should roughly reflect the market’s consensus for future inflation. If we want to see inflation expectations over a longer term, we can use the Treasury and TIPS yield curve rates which are published daily on the U.S. Treasury Department website. I’ve created an Octave script to generate plots of inflation expectations using the Treasury data. The next plot uses the rates from the Treasury website, and a spline interpolation method to generate the Nominal and Real Treasury Yield curves. The difference here can be interpreted as the rough annual inflation expectation over a horizon equal to the time to maturity. A problem with the two graphs I have shown is that the bond yields reported at each maturity are the rates for “coupon” bonds. This means that a coupon payment is paid out to investors at each 6-month interval, so the yield is really a weighted average interest rate for the various cash flows investors receive at dates up to and including the final principal payment. 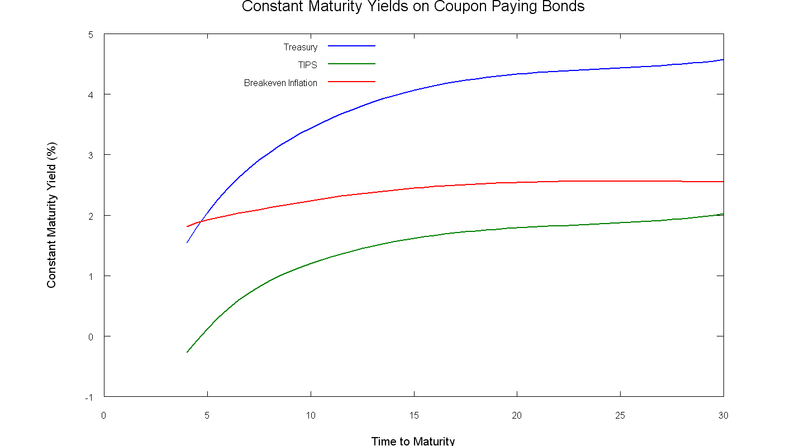 In order to get a pure measure of the interest rates at each maturity we must remove the effects of the coupon payments. 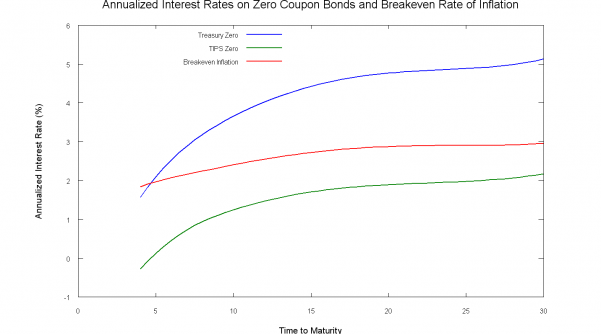 The next graph shows the “zero coupon” interest rates at each horizon. These curves were derived from the coupon curves using a “bootstrap” methodology. 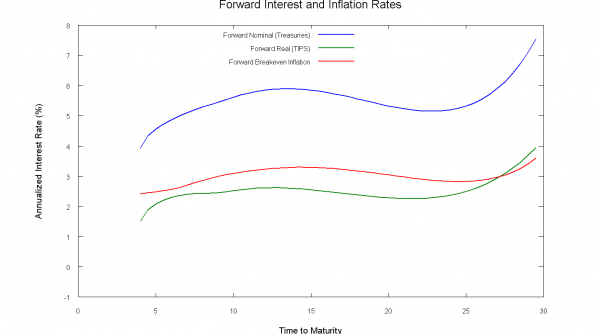 These curves show a cleaner measure of interest rates and the breakeven inflation rate at each horizon. Notice that the breakeven inflation in this graph is somewhat higher now that interest rates have been adjusted to show the zero coupon rates, but it is still below 3% at all horizons. Finally, it is possible to process this data further and compute the forward interest rates and inflation expectation at each point in the future. However, we don’t really have enough data to do this properly, and the shape of the graph is very dependent on the interpolation method used to fill in the missing maturities. Be sure to take this next graph with a grain of salt! In particular, I believe the dip and steep upswing in rates at the long horizons is an effect of the interpolation method. There are several reasons why the breakeven inflation rate is not a perfect estimate of inflation expectations. First, investors in Treasuries bear the risk that inflation may be very different from the level expected by the market, but investors in TIPS, which are adjusted for whatever inflation occurs, do not bear this risk. So, the Treasury yield may include an extra risk premium to compensate for this additional risk. A second distortion is that the Treasury market is more heavily traded and liquid than the TIPS market. As a result, the yields on TIPS may have an additional premium to compensate for lower liquidity. This may partly explain why the 5-yr breakeven inflation rate, shown in the first graph, went negative in 2008. Some investors believe that this signaled expected deflation, but others believe that a rush to liquidity caused the liquidity premium to increase which pushed up the yields on TIPS. Finally, some investors believe that the CPI, which is used to adjust the principal and coupon payments on TIPS, is not an accurate measure of the true level of inflation. That discussion is outside the scope of this post, but it is true that the inflation expectation measured by the breakeven rate is inflation as measured by the CPI. Inflation has the potential to greatly affect our investment outcomes. I think it will be interesting to keep an eye on inflation expectations over the coming years since they are an important input for Federal Reserve decision making, and they are a measure of the market’s confidence in the Fed’s ability to do its job. However, I don’t think that estimating the level of inflation expectations will provide any actionable insight which will help you to improve your investment performance. In constructing an investment portfolio, you should consider and plan for the possibility of inflation regardless of the level of future inflation expected by the market. Great article and set up for an intro into this subject. Many Thanks! Thanks for explaining this concept. I had for some time been wondering about how the inflation expectations were derived.